1 nori (a dried seaweed sheet, opt for the darkest and most tightly "knit"
1.Slice the cucumber into 1/4 inch thick circles and lay out onto a plate. 2.Dice the tuna and green onions and throw them into a medium mixing bowl. 3.Into the bowl, add the Greek yogurt, hot sauce, garlic powder and salt. Make sure to taste and adjust the salt to your preference. 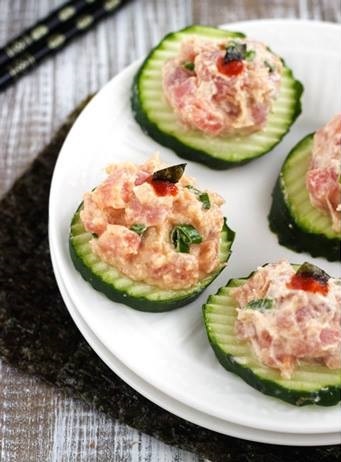 4.Scoop about 1 Tbsp of tuna onto each cucumber and garnish with additional sriracha and sliced nori (if desired.) Alternatively, if you want it to taste even more like sushi, mix some extra minced nori into the tuna mixture.